Spinnaker can be configured to listen to changes to a repository in GitHub. 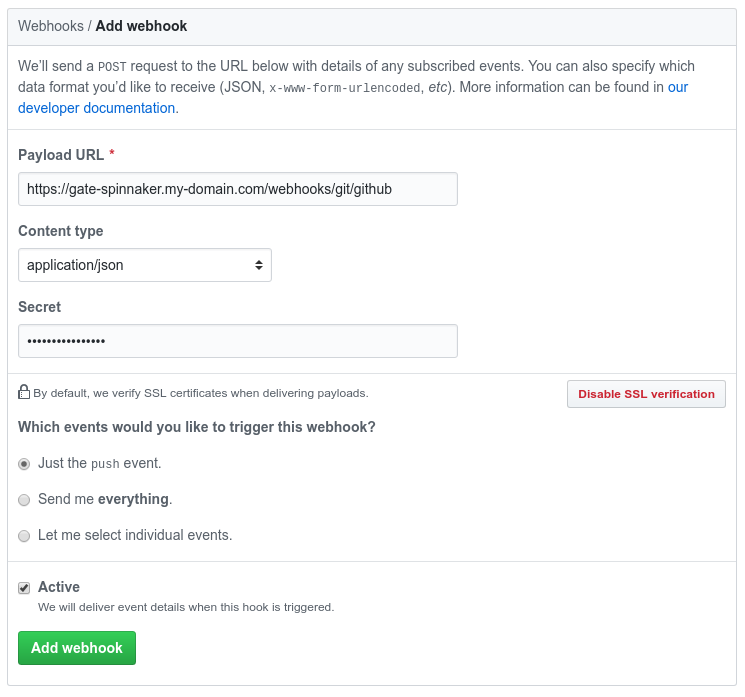 These steps show you how to configure webhook push events to send to Spinnaker from a single GitHub repository. You need Spinnaker’s API running on an endpoint that is publicly reachable. Ideally this means that you’ve configured authentication. This is required to allow GitHub’s webhooks to reach Spinnaker. If you’re unsure of what your Spinnaker API endpoint is, check the value of services.gate.baseUrl in ~/.hal/$DEPLOYMENT/staging/spinnaker.yml. The value of $DEPLOYMENT is typically default. If you’re unsure, see the Halyard reference. You need a GitHub repository to send Webhooks from. Payload URL Given that the above prerequisite API endpoint is $ENDPOINT, enter $ENDPOINT/webhooks/git/github. While all GitHub webhooks share an endpoint in Spinnaker, there is no practical limit to the number of repositories you can configure to send notifications. Secret The value is up to you, and must be provided to any GitHub webhooks triggers that you configure within Spinnaker. It’s used to ensure that only GitHub can trigger your pipelines, not an imposter. You do not need to configure Spinnaker via Halyard at this point – all that’s needed is pipeline trigger configuration. An example of that can be found in this guide.